The Force Awakens won’t be in the theaters until December 18th, but you can already enjoy the thrilling Star Wars dogfights waged by the pilots of the Resistance and First Order with The Force Awakens™ Core Set for X-Wing™! The Force Awakens Core Set comes with everything you and a friend need to assemble your fighters and launch into battle. You’ll find one pre-painted miniature Resistance T-70 X-wing and two pre-painted miniature First Order TIE/fo fighters, all meticulously detailed and created at 1/270 scale. 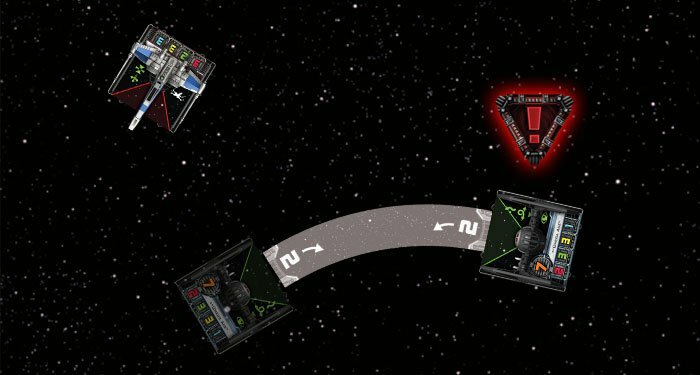 In X-Wing, these ships are represented not only by the miniatures that you maneuver across the battlefield, but also by their ship cards, which indicate the ship’s attack and defense values, as well as the relative value of its pilot’s skill, and any unique ability that pilot might have. Yesterday, we took a look at the Resistance’s signature starfighter, the T-70 X-wing. Today, we turn our attention to the First Order and its TIE/fo fighter. Designed to take advantage of swarm tactics and numerical superiority, the TIE/fo fighter is an extremely agile, mass-production fighter designed for swarm tactics. However, it’s not quite as fragile as the TIE fighters that were flown during the Galactic Civil War. Instead, its hull and shields were reinforced to improve survivability. The result is a more durable First Order fighter with two attack, three agility, three hull, and a point of shields. These statistics make the TIE/fo fighter less individually powerful than the T-70 X-wing that we saw yesterday, but there’s another important number associated with every ship in X-Wing – its squad point cost. Once you’ve learned how to play X-Wing, the game’s rules for squad building afford you tremendous flexibility in your tactics and strategies, even with just a few ships. In short, you start with a certain number of points that you can spend to build your squad, and each ship card and upgrade you select costs you a certain number of those points. Although the T-70 X-wing is both harder-hitting and more resilient than the TIE/fo fighter, it is also significantly more expensive to produce and costs more squad points. 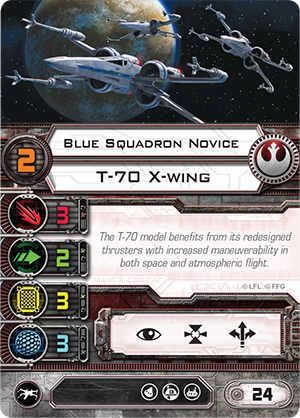 At twenty-four squad points, the least expensive X-wing, the Blue Squadron Novice , costs a full nine squad points more than the First Order’s fifteen-point Epsilon Squadron Pilot. This means that your TIE/fo fighters should consistently outnumber the Resistance’s X-wings, and the TIE is, accordingly, designed to take advantage of this fact. As a First Order squadron leader in X-Wing, you want to maintain the advantage of your superior numbers as long as possible. Among other things, this means that you’ll want to select your maneuvers and actions each round in order to discourage your Resistance opponent from consistently focusing fire on a single TIE. 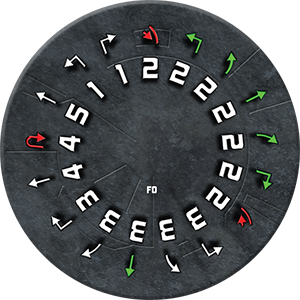 The First Order TIE/fo fighter’s maneuver dial is loaded with options for darting about the battlefield in close-quarters dogfights. 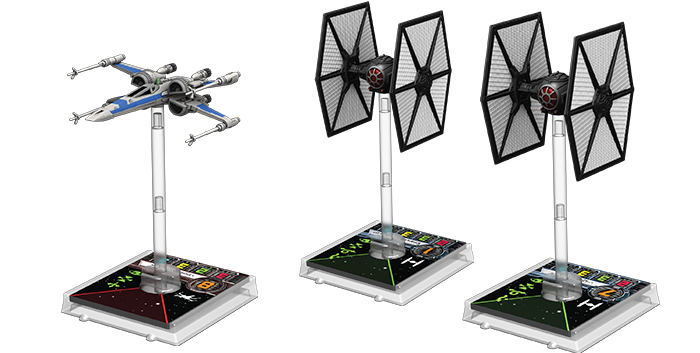 Fortunately, the TIE/fo fighter offers you plenty of options for shaking a tail and then slotting back into firing position behind an X-wing. Its maneuver dial is loaded with hard, quick turns, including a speed “1” turn that the X-wing can’t match. It also features a full range of green, speed “2” turns, banks, and straight maneuvers. All together, these make the ship extremely well-suited to the sort of tight turns that you’ll want to execute in close-combat. Meanwhile, your TIE pilots can take advantage of the ship’s loaded action bar. Like the X-wing, the TIE/fo fighter allows its pilots to both perform both the Acquire a Target Lock and Focus actions. However, whereas the X-wing features the Boost action, the TIE/fo fighter trades that action away in order to gain both the Evade and Barrel Roll actions. 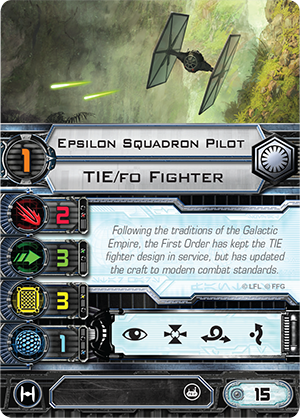 The Evade action is an excellent option for TIE pilots engaging X-wings at long range as it can help them fly unscathed until they can close to Range “1” and perform their attacks with an extra attack die. Meanwhile, the Barrel Roll action grants TIE pilots tremendous flexibility as they dodge asteroids or try to duck out of an X-wing’s firing arc. It can even help your TIE/fo fighter pilots disrupt your enemy’s flight paths or line up shots they wouldn’t otherwise have been able to take. "Omega Ace" performs a barrel roll to avoid an asteroid and catch a Resistance X-wing pilot within his firing arc. If plan your maneuvers and actions appropriately, your TIEs can fly at Resistance fighters, get off a few shots to wear down their shields, and then break away from the engagement with tight turns, Barrel Rolls, and the Evade action. At this point, however, you’ll need a plan to get back into the fight, and this is where the TIE/fo fighter’s speed “4” Koiogran turn comes into play, along with its two speed “2” Segnor’s Loops. 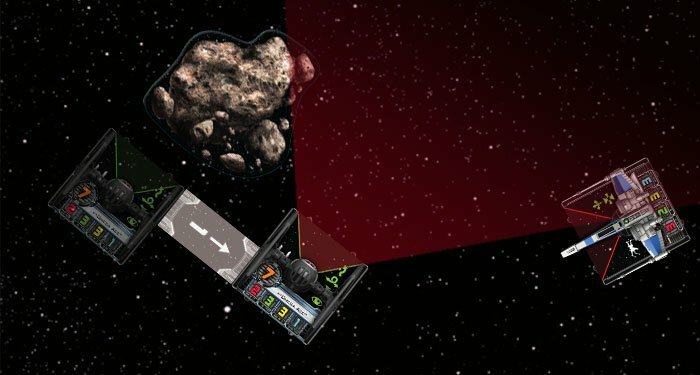 When you execute any of these difficult maneuvers with your TIE, you don’t slot the far end of the maneuver template into the ship’s rear guides. Instead, you rotate your TIE until it’s facing the direction from which it came and its front guides are lined up with the maneuver template. By executing a speed “2” Segnor’s Loop, the Epsilon Squadron Pilot is able to stay in the fight. However, after completing this difficult maneuver, he must take a stress token and is unable to perform an action. Executing either a Koiogran turn or a Segnor’s Loop will stress your TIE, and it won’t be able to take an action that round. However, if you time these maneuvers correctly, you’ll be lining up shots at X-wings that are in no position to return your fire. It’s all part of your plan to win by attrition. After all, as a member of the First Order, the odds are in your favor! The TIE/fo fighter is always a fast, slippery ship, no matter who’s sitting in its cockpit. Still, there are definitely a number of veteran pilots within the First Order who are simply able to get more from the ship than their colleagues. The Force Awakens Core Set comes with nine different TIE/fo fighter ship cards, including three unique veterans. Identified by their call signs, these First Order pilots are able to handle their TIEs in ways that less experienced pilots simply can’t. 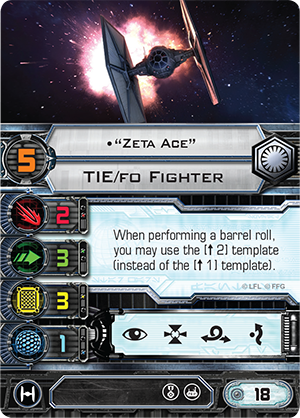 At eighteen squad points, the pilot known as “Zeta Ace” costs more to field than your basic Zeta Squadron Pilot , but his pilot skill value is two points better, affording him more time to react to enemy movement and making him quicker on the trigger. Additionally, his unique pilot ability allows him to use the straight speed “2” template when he performs a Barrel Roll, instead of the speed “1” template. 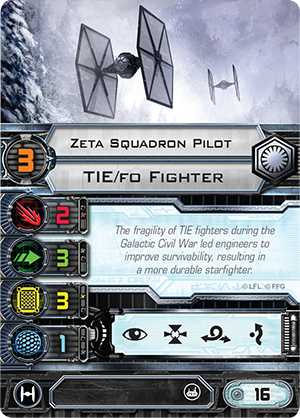 Along with his increased pilot skill, this ability makes “Zeta Ace” far more capable of outmaneuvering enemy fighters than the other, rank-and-file members of Zeta Squadron. It’s always a risky decision to take stress on your ship because stress prevents you from performing actions, meaning you can’t Barrel Roll out of a firing arc, save up an Evade token with the Evade action, or even Focus in order to convert your results to results during combat. However, ships flying in close formation to “Epsilon Leader” are in better position than others to momentarily absorb a measure of stress. Because they get rid of their stress at the beginning of combat, they don’t need to execute green maneuvers in order to get rid of their stress. That leaves them free to perform more unpredictable maneuvers. They could even perform back-to-back Segnor’s Loops, a feat so incredibly rare and difficult to perform that it’s bound to take most Resistance pilots by surprise. 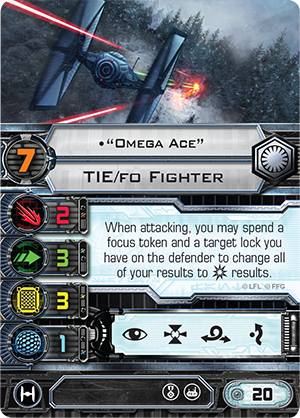 Finally, you have “Omega Ace,” the veteran TIE pilot with the highest pilot skill value in The Force Awakens Core Set. At a pilot skill value of seven, “Omega Ace” will activate after all but the most skillful X-Wing pilots, meaning that he can perform his actions with better knowledge of his target’s plans. While the ability to react to your opponent’s final position is always good, it’s even better for “Omega Ace,” who wants to use as many actions as possible to coordinate the devastating volleys he can unleash as a result of his unique pilot ability. There will always be moments that you’ll want “Omega Ace” to perform a Barrel Roll and slip out of an X-wing’s firing arc, but you’ll generally want to use his actions to guarantee shots of two or three results. This means first performing the Acquire a Target Lock action, then performing the Focus action. Such long-term planning is difficult to pull off, and it’s not for lesser pilots. However, when “Omega Ace” manages to truly catch his foe in his sights, it’s an inspiration to First Order pilots everywhere! 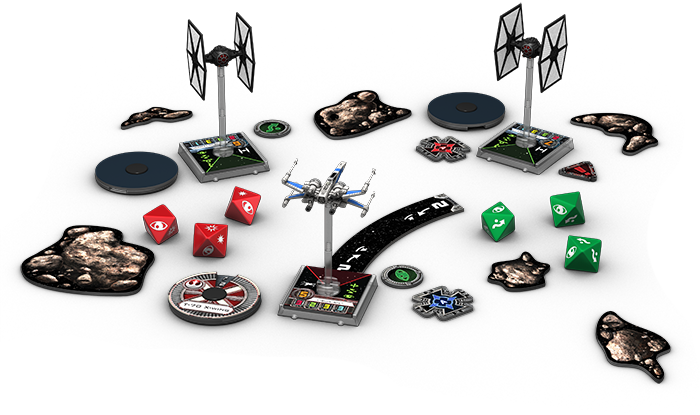 With its three painted plastic miniatures, ship cards, upgrades, tokens, templates, and maneuver dials, The Force Awakens Core Set includes everything that you need to launch into the tense, fast-paced fighter battles waged between the forces of the Resistance and the First Order. 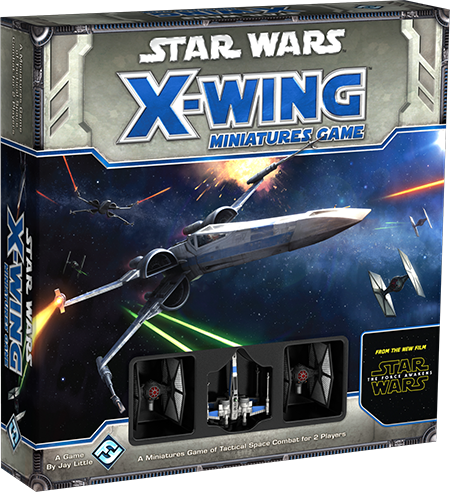 However, veteran X-Wing players and those looking to expand their battles beyond the Core Set will be able to tap into another whole galaxy’s worth of options by pairing the starships from their The Force Awakens Core Set with those from any number of different X-Wing expansions. 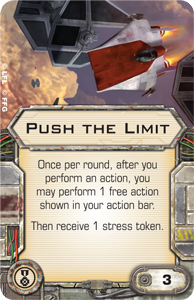 Will you upgrade “Omega Ace” with the Push the Limit elite pilot talent featured in the Imperial Aces Expansion Pack? 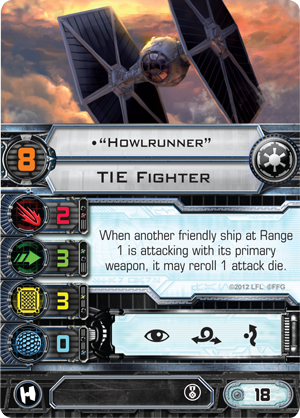 Will you recruit “Howlrunner” to lead your swarm of TIE/fo fighters? 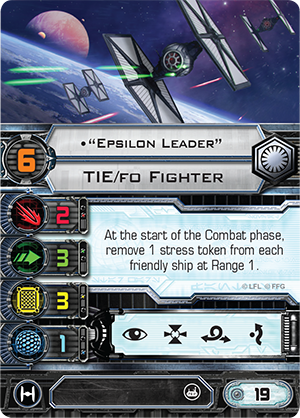 Will “Epsilon Leader,” instead, lead a swarm of TIE/ln fighters into battle? The possibilities are nearly endless, but they all begin with The Force Awakens Core Set! Meanwhile, there’s still more to come! Keep checking back for more information about the T-70 X-wing, the TIE/fo fighter, and the many ways that the The Force Awakens Core Set will help to shape the future of X-Wing!